Of the Circumferent or out-stroke, and his looseness and a good Position, as also of keeping of their Parts. BEcause we have now made a description of the principal properties belonging to this art; and necessarie to be known and understood, it is requisit now (for to make a compleat and perfect work) thorow a short instruction to show, how the same work must be perfected and compleated, in exercising the art of drawing: for as much as this order in drawing is the best, and fittest, viz. first to understand drawing in its self, and then to begin, and so doing and learning finish, and compleat the same. I have also bin willing in my discription and teaching to observe and follow the same. Strokes on the side of the light to make sweet. The life is without strokes. If it be so, that you draw with red or black chalk, have special care that your strokes be not too hard or too sharp, principally in the light; but in the shadowed part you may make them stronger and broader, always observing, that in shadowing your strokes do thus lose and vanish away, that no strokes may remain more, so that a body might judg your draught to have been drawn without a circumferent stroke: for in the natural life no stroke can be seen, but only one cind, or one impaled desisting of bredth and length of corporal things, passing all sides, or seem to touch each other; this you may observe in a picture clearly, where the uttermost parts of all things do agree with the color which is in the midst of its field; so that the termination of this or that colour doth represent the circumference without drawing of a stroke about it. Strokes you must not draw till necessitated. Small things are drawn without strokes, and appear as if they were. And although it often hapneth, that in drawing betwixt white and white, and against the light, a stroke must be drawn, for to shew the draught of the one or the other, especially upon white paper, yet shall you not do the same before necessity compelleth you thereunto, and there is no other way for to do it, and this you shall do with as much dexterity of hand as possible. One may in many things (especially in little) present against the light without drawing of a stroke, which nevertheless shall shew so compleat as if a circumferent stroke was drawn about it; and because I cannot speak of all causes incident herein, I will pass it over, putting before your eyes one example for all, giving leave to the Practitioner to order the rest, according as the spirit of the Practitioner, the condition of the Work, and his Judgement shall give him leave. 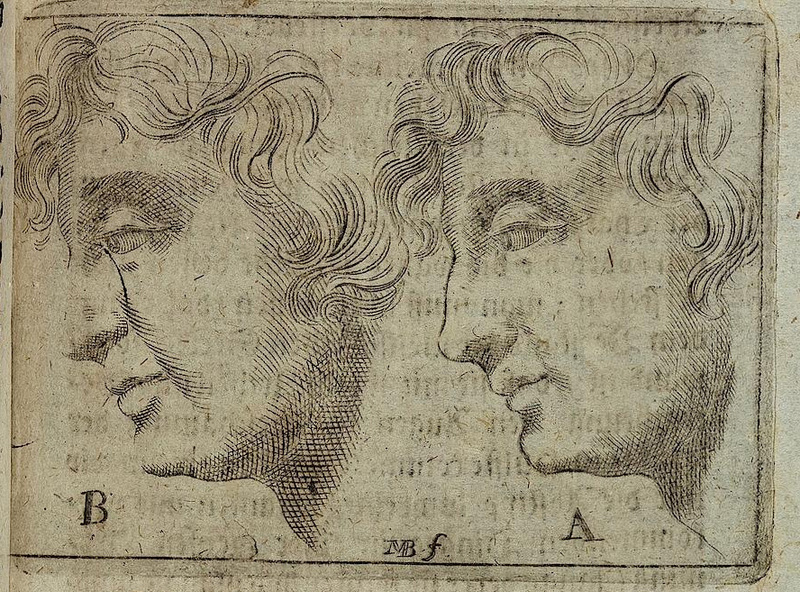 You see then, that the face drawn with A before, is circumscribed with a compleat line or stroke; and the face B doth only represent the shadow that are underneath the Nose and Mouth; Now the question is, whether there be an error committed in the face B, which in the face A thorow the out-stroke might be amended? I supposed not; but contrariwise in the face B is observed a singular and handsom curiositie, where white against white makes a termination, without a circumferent or out-stroke betwixt them. The meaning of this Example being once well understood, you will accustom your self to profit there by from day to day, and the beforementioned looseness and dexterity know and understand with better judgement to make use of in your drawings hereafter, and shall beget a singular good manner in drawing, not knowing from whence it cometh unto you. That which is said, you must not understand of all manner of drawing, for a rude Scetch only consisteth in circumferent lines or out-strokes; nevertheless the dexterousness therein gives it a singular benefit; by consequence you may apprehend how you may work upon coloured paper, forasmuch as there is small difference, only that thorow heightenings you may do much and save many strokes, which cannot be done upon white paper; therefore in this manner of drawing you shall more take heed then in any other, to draw strokes in the light, especially while this may be supplied by heightning; and this is in short what we have to observe concerning the freeness and dexterity of the out-stroke.